News about the on-going payment dispute between a group of writers and a well-known tech blog, has made me think about the unpaid bloggers debate. There have been a couple of great leaving notes this week. One from a headmaster writing about a colleague retiring (warning: contains coded rudeness), and another from the CEO and founder of e-commerce site Groupon, who wrote a funny and honest leaving email and posted it on the web. It’s interesting that the headmasters note, clearly not meant to get widely reported, was picked up for its rather creative use of language. 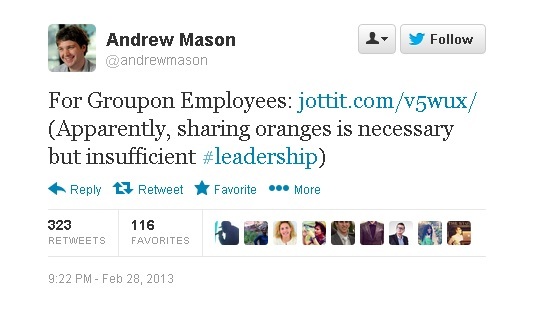 While Andrew Mason’s obvious humour and class has ensured that he’s come out of the firing smelling of roses. It shows that even everyday writing can be powerful and influence the reputation of people and businesses. I love the idea of focusing on a task for 33 minutes, then having a few minutes break before continuing. Copywriting can be quite mentally draining. Add to that the time spent at the beginning or end of the day doing novel rewrites and soon you’re never leaving the computer (I’m guessing adding a Sims 3 addiction to this doesn’t help…oh, that’s just me?). If you’ve seen any articles or blog posts this week that have made you think (including your own, I know that my last post, on using active versus passive voice, has made me take a long look at related grammar rules) feel free to share in the comments.